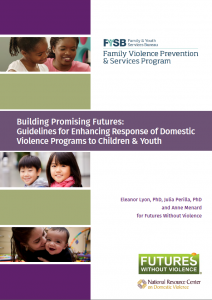 Building Promising Futures: Guidelines for Enhancing Response of Domestic Violence Programs to Children and Youth, by Eleanor Lyon, PhD, Julia Perilla, PhD, and Anne Menard for Futures Without Violence is a new resource for DV programs. The manual presents program guidelines for consideration to improve the services for children exposed to domestic violence and explores how DV programs can best respond simultaneously to the needs of children and their caregivers. Separate responses to mothers’ and children’s safety and well-being often place them at odds with one another. In contrast, an integrated approach to intervening with the family as a whole results in better outcomes for children, their mothers, and the whole family. Reflect a commitment to working with abused parents and their children/youth in organizational mission and values statements. Recognize that, whether they plan to leave the relationship and/or remain in contact, abused parents are thinking about their children’s safety and well-being when they seek services, and prepare all advocates to talk with parents/caregivers about their children as part of their ongoing contact with them. Use intake forms, assessments, and approaches that reflect a strengths-based (rather than a deficit-based) approach. Prepare all advocates to explore the strengths and challenges facing each member of the family, including young children, as well as what would be helpful to them. Always retain openness to each survivor’s perspective and respect her decisions regarding her relationship, including decisions to stay in the relationship or stay connected to her partner. Create rights and responsibilities, rather than rules, for program participants, that are trauma informed, allow flexibility, and ease stress. Create an environment that is family-friendly, reducing stress wherever possible for both mothers and their children/youth. Create an explicit plan for how the program approaches children, including how and when they are included in conversations (especially conversations about violence), and the considerations that will guide decisions about inclusion, such as their developmental stage.